Celebrating her birthday and you want to find a special romantic birthday message? Find below many special love birthday messages for her written by a woman who knows how to make a woman’s heart melt, just because she is a woman too! No matter if she is your girlfriend, fiance or wife, birthday Love messages and wishes should be extremely romantic and able to talk right to her heart. Write it on a piece of paper so these words will last forever! I have known that you are the one to make my life complete. The twinkle in your eyes has had me captivated for all this time. Every single day I am thankful that you are in my life. But today, especially, because it’s the day you were born. Happy Birthday, my sweet love. I take a deep breath and thank God for giving us a life together. Happy Birthday to the one I pray I never have to wake up without. There could never be enough words to tell you what you mean to me. I pledge to make sure I tell you that you are mine and that you are loved. and now we have kids of our own. They are a reflection of the amazing wife and mom you are. Happy Birthday to the woman seems to always find a way to do it all. With every breath I take, I pray you know how much I love you. Happy Birthday to my everything. And I know there is even more of this life to see, somehow. By snuggling close and eating cake. Here’s to another year and many more. I love the way you tuck your hair behind your ears. I love the way you smile when you see our kids playing together. I love the way you fall asleep before you finish a chapter of any book. Or how thankful I am for everything you do. I just want you to know how deeply I appreciate you. Birthday Wishes to the one I want to spend the rest of my life with. It’s you and me forever, babe. I will be able to bring you breakfast in bed and decorate the house. and just want you to know how very excited I am! but “I love you” truly says it all. I look at you and can’t believe that I love you even more. Happy Birthday to the one I want to spend all of your birthdays with. I pray you feel special and know how much you are loved! in plenty and in want, in rich or in pour, in sickness or in health. I want you to know today that all of that is still true and no matter what comes our way I am thankful to get to stand beside you. Now and always, my love. It always amazes me how much you do and how well you are able to do it all. I love you and am so thankful that you are mine! Our days are busy and our time together is not as spontaneous as it once was. We both work all day and do our best to keep our household running and together. Even through all of it, you are still the one I want to see at the end of the day and I still think about you all day long. Today, I want to remind you that you are mine and I am yours, forever. I love you. Our marriage is a testimony that love can truly make it through any storm. We have seen so many ups and downs in our relationship, but we have made it through it all. 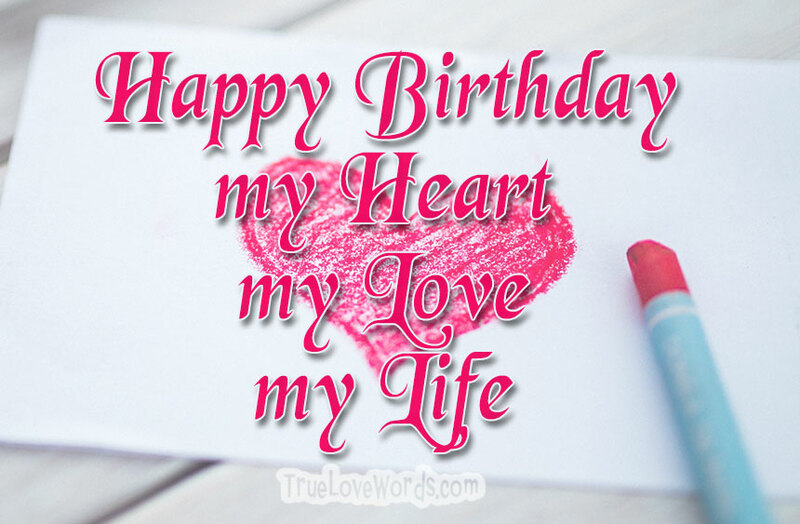 My heart is yours, not only on your birthday, but every day! I love you so much. Here’s to many more! than I did the day we got married. because I love you and want you to know how much you mean to me. So here’s to a day celebrating you! but I am so glad I did and I want you to know how much I love our life together. To celebrate you birthday we are going to do something you have always wanted to do. You are going to take a bubble bath, and I am going to handle dinner and the dishes! and makes me feel like the luckiest person in the world!